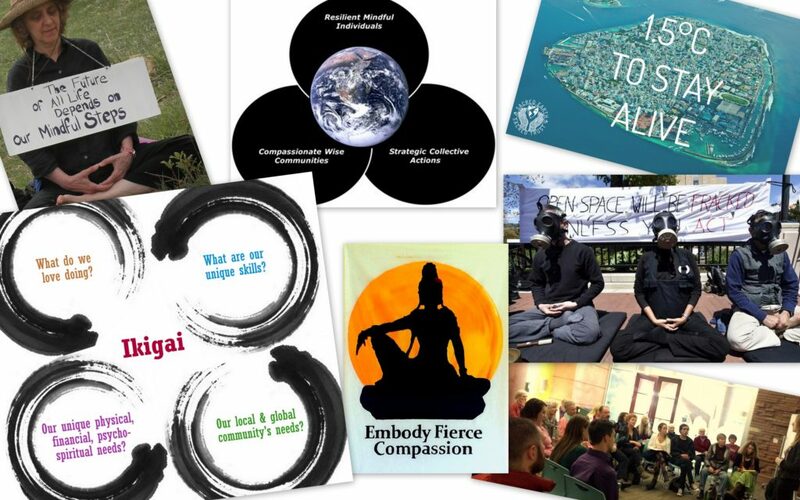 Boundless in Motion is an “engaged spirituality” collective aimed at building a trauma-informed spiritually rooted movement towards justice, equity and inclusion for all life on the planet. We extend a special welcome to those who identify as LGBTQ, black, indigenous and other people of color to join us and bring diverse perspectives to our practices, frameworks and theories of change. We are based in South Boulder, Colorado. Climate crisis induced chaos is not inevitable. Our plans change in real time. Historically, we have been organized around what we refer to as the three pillars of Ecodharma. Our meditation based gatherings and grief-circles focus on the pillar of individual-level trauma healing, psycho-spiritual opening and resilience. Boulder Eco-Dharma Sangha and its practice circles are our “projects” that focus on relationship building for strategic actions to stop worsening climate chaos and speciesim, weaken other inseparable systems of oppression (supremacy of European culture, neoliberal economy, consumerism and income disparity, homelessness) and promote community uplift. We invite you to join us. Please consider our weekly meditation (zazen), Zen (sesshins) or other contemplative retreats, ecodharma practice circles or other public Eco-Dharma events. To meet our ecological predicament with authenticity, wisdom and compassion, explore our online offerings including dharma talks (teishoes), presentations and articles on our ongoing ecological crisis.